Candles have been a part of meditation practices for centuries, some people even use them as their focal point for meditation (learn more about candle gazing meditation). A candle can help you create a special meditation space and atmosphere or it can be used to enhance your meditation through aromatherapy. Since candles are often low cost and easy to buy at a variety of stores, they are a great option to add to your meditation routine. This article details the best candles for meditation, explaining the benefits of each one. (If candles aren’t an option for you because they are restricted where you live or meditate, consider using essential oils for meditation.) These candles are also great to provide aromatherapy benefits while practicing yoga. Generally, when shopping for candles you should look for non-toxic options. 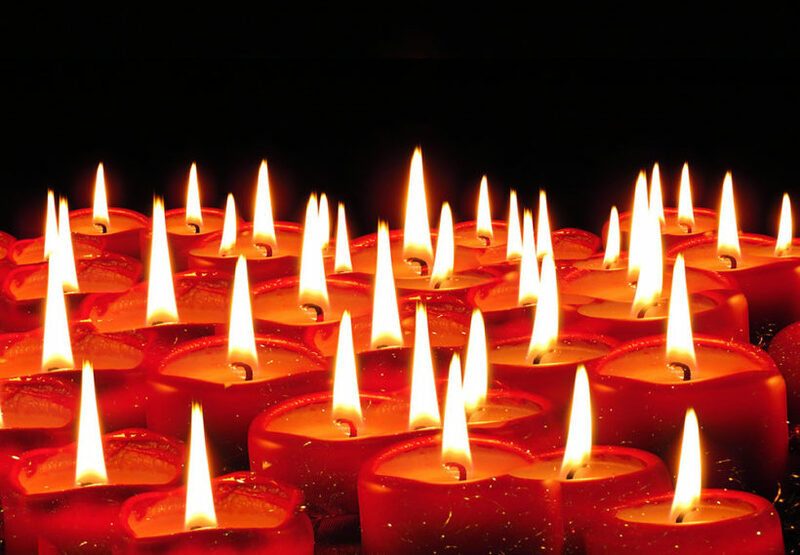 Many candles are made from things like paraffin, which is actually toxic. Candles made from natural or non-toxic ingredients like soy or beeswax are usually a better choice. Keep in mind the scent of the candle and also the color of the candle if you will be using it for a candle meditation. This is a candle that no only provides great meditation benefits, but also looks great as well. La Joile Muse makes a variety of beauitful soy wax candles and this one is makes a great meditation candle. Infused with the essential oils of ylang ylang and jasmine, this candle offers aromatherapy benefits like stress relief and improving mood. Jasmine is also great for combating exhaustion. The chamomile is calming and helps with anxiety. This candle is perfect to use during times of sadness or depression and is great for a mood boost. If you’re using it for a candle meditation, the color rose represents self-love, romance, and sensuality. This candle makes a nice gift, especially a good Valentine’s Day gift for a loved one who meditates. This is a 10 oz candle with 60-80 hours of burning time. It’s made from eco-friendly soy wax, which burns evenly and cleanly. Root Candles is a family owned company that has been selling candles since 1869. They have an entire line of candles with essential oil scents that are specially blended for different purposes. This is their meditation candle which utilizes a variety of scents to help you focus. Veviter is calming and the scent is spiritually grounding to help with mindfulness. Olibanum (commonly known as frankincense) has similar effects, calming your mind without making you sleepy. In addition to grounding you, myrhh also helps mellow heightened emotions like anger or sadness. These scents will calm your mind and help your meditation practice. The color blue represents the energy of sweetness, self-protection, and loyalty. Made in the USA, this 6.5 oz. candle comes in a jar and offers up to 65 hours of burn time. It’s made from essential oils and a natural soy wax blend. The sustainable wood wick also offers a comforting crackling noise that will either enhance or distract your meditation, depending on your preference. Aloha Bay mades an entire line of chakra candles, made from essential oils and colors targeted at each of the seven chakras. Their Happiness candle is for the Sahasrara chokra located at the crown of the head. This candle utilizes three different essential oils that are great for meditation. Patchouli is a very grounding scent, perfect for your practice. Labdanum can help moderate your emotions and increase self understanding. Frankincense is perfect for calming your mind. These scents combined help promote happiness. The color purple (or violet) help you connect your higher self and make dreams reality. Made from palm wax and pure essential oil, this 11 oz. candle has a cotton wick. They’re made in the USA and are 100$ paraffin free. Good for: Promoting positive emotions and ground the mind. Lavendar is very common in candles for meditation, and this one is all lavendar. Hand made by Wax & Oils, this candle features lavender essential oils. Lavender is a very calming scent. It’s sedative powers are perfect for unwinding after a long day or meditating right before bedtime. If you suffer from insomnia, this is the candle you want to light for a meditation to fall asleep. Lavendar is also great for relieving stress and anxiety and perfect for those days when you can’t quite calm your mind and unwind. This 8 oz candle is made from soy wax and comes in a tin. Pure makes natural aromatherapy candles in hip mason jars. Their soy candles are made with premium essential oils that are great for enhancing meditation. Their Vitality candle utilizes spearmint and eucalyptus oils. In addition to relieving stress and clearing your mind, spearmint is great for uplifting your mood. Eucalyptus oil also helps with respiratory issues, so this a great candle to use if you’re sick or dealing with allergies. This scent combination is great for peace and balance, plus it smells divine. Green is color is taken directly from nature and express self-esteem and self-affirmation. It’s also the color of new growth, helpful for healing. These candles are made with hand-poured soy wax and a cotton wick so it burns cleanly for about 80 hours per candle. Looking for more meditation supplies to enhance your meditation practice? Check out essential oils for meditation, mala meditation beads, and meditation shawls and scarfs. Learn how to do a candle gazing meditation. Life is hectic. But it doesn’t have to be. Awake & Mindful is about living a thoughtful life, focusing your energy and your time on the things that matter. Meditation to calm your mind. Yoga to strengthen your body. Plus all the other things that add a sparkle to your life.